Genghis Khan ruled between 1206 and 1227, expanding trade across Asia and into eastern Europe, enacting relatively tolerant social and religious laws, and leading devastating military campaigns that left local populations depleted and fearful of the brutal Mongol forces. Genghis Khan was the first leader, or Khan, of the Mongol Empire, from 1206 CE–1227 CE. Genghis Khan generally advocated literacy, religious freedom, and trade, although many local customs were frowned upon or discarded once Mongol rule was implemented. In terms of social policy, he forbade selling of women, theft of property, and fighting. This ruler used groundbreaking siege warfare and spy techniques to understand his enemies and more successfully conquer and subsume them under his rule. Genghis Khan led merciless conquests of the Western Xia Dynasty, the Jin Dynasty in 1234, the Kara-Khitan Khanate, and the Khwarazmian Empire. Many local people across Asia considered Genghis Khan a dark historical figure. Khan: The universal leader of the Mongol tribes. Temujin: Ghengis Khan’s birth name. Uyghur-Mongolian script: The first writing system created specifically for the Mongolian language and the most successful until the introduction of Cyrillic in 1946. This is a true alphabet with separate letters for consonants and vowels, alphabets based on this script are used in Inner Mongolia and other parts of China to this day. Before Genghis Khan became the leader of Mongolia, he was known as Temujin. He was born around 1162 in modern-day northern Mongolia into a nomadic tribe with noble ties and powerful alliances. These fortunate circumstances helped him unite dozens of tribes in his adulthood via alliances. In his early 20s he married his young wife Börte, a bride from another powerful tribe. Soon, bubbling tensions erupted and she was kidnapped by a rival tribe. During this era, and possibly spurred by the capture of his wife, Temujin united the nomadic, previously ever-rivaling Mongol tribes under his rule through political manipulation and military might, and also reclaimed his bride from the rebellious tribe. As Temujin gained power, he forbade looting of his enemies without permission, and he implemented a policy of sharing spoils with his warriors and their families instead of giving it all to the aristocrats. His meritocratic policies tended to gain a broader range of followers, compared to his rival brother, Jamukha, who also hoped to rule over greater swaths of Mongolian territory. This split in policies created conflict with his uncles and brothers, who were also legitimate heirs to Mongol succession, as well as his generals. War ensued, and Temujin prevailed, destroying all the remaining rival tribes from 1203–1205 and bringing them under his sway. In 1206, Temujin was crowned as the leader of the Great Mongol Nation. It was then that he assumed the title of Genghis Khan, meaning universal leader, marking the start of the Mongol Empire. The first great khan was able to grasp power over such varied populations through bloody siege warfare and elaborate spy systems, which allowed him to better understand his enemy. He also utilized a lenient policy toward religious and local traditions, which convinced many people to follow his lead with promises of amnesty and neutrality. Genghis Khan: Genghis Khan as portrayed in a 14th-century Yuan-era album. He was the first leader of the unified Mongols and first emperor under the Mongolian Empire. Organizing his army by dividing it into decimal subsections of 10, 100, 1,000, and 10,000, and discarded the lineage-based, tribal bands that once dominated warfare. Founding the Imperial Guard and rewarding loyalty with high positions as heads of army units and households no matter the class of the individual. Proclaiming a new law of the empire, called the Yassa, which outlawed the theft of property, fighting amongst the population, and hunting animals during the breeding season, among many other things. Forbidding the selling of women. He also encouraged women to discuss major, public decisions. Unlike other leaders in the region, Ghengis allowed his wives to sit at the table with him and encouraged them to voice their opinions. Appointing his adopted brother as supreme judge, ordering him to keep detailed records of the empire. of this, Muslims, Buddhists, and Christians from Manchuria, North China, India, and Persia were more likely to acquiesce to Mongol intrusions and takeovers. Encouraging literacy and adopting the Uyghur script, which would form the Empire’s Uyghur-Mongolian script. These conquests seriously depopulated large areas of central Asia and northeastern Iran, complicating the image of Genghis Khan as a peaceful ruler practicing religious tolerance. Any city or town that resisted the Mongols was subject to destruction. Each soldier was required to execute a certain number of persons in cities that did not cooperate. For example, after the conquest of the city of Urgench, each Mongol warrior, in an army that might have consisted of 20,000 soldiers, was required to execute 24 people. Sack of Baghdad: Illustrations of Mongol advances show the deeply militaristic reality of this empire’s success, and the darker side of Genghis Khan’s rule. By 1260, the armies of the Mongol Empire had swept across and outward from the Asian steppes. The dark side of Genghis Khan’s rule can be seen in the destruction of ancient and powerful kingdoms in the Middle East, Egypt, and Poland. During the same period, Mongol assaults on China replaced the Sung Dynasty with the Yuan Dynasty. Many local populations in what is now India, Pakistan, and Iran considered the great khan to be a blood-thirsty warlord set on destruction. The Mongols’ military tactics, based on the swift and ferocious use of mounted cavalry, cannons, and siege warfare crushed even the strongest European and Islamic forces and left a trail of devastation behind. Even populations that appreciated the new legal code and relative religious tolerance did not have much free will when it came to Mongol advances. Many times Jewish kosher traditions and Muslim halal traditions were also cast aside in favor of Mongol dining and social customs. Genghis Khan died in 1227 under mysterious circumstances in possession of one of the largest empires in history. He left these vast holdings in the hands of his sons and heirs, Ögedei and Jochi, who continued to expand outward with attacks and political alliances in every direction. Under Genghis Khan and his son Ögedei, the Mongol Empire conquered both the Western Xia Dynasty and the Jin Dynasty to the west. Recall the significance and consequences of the Mongol Empire’s battles with the Western Xia and Jin Dynasties. Under Genghis Khan, the Mongol Empire conquered the Tanguts’ Western Xia Dynasty in 1209. Afterward, Genghis Khan began the conquest of the neighboring Jin Dynasty in 1211. The Jin Dynasty would finally be successfully conquered by Genghis’ son, Ögedei Khan, in 1234.
ethnocide: The destruction of a national or localized culture in the wake of a population’s destruction. Zhongdu: The capital of the Jin Dynasty before the Mongol attacks, situated where modern-day Beijing sits. Badger Pass: The location of the battle between Genghis Khan’s Mongol Empire and the Jin Dynasty, where the Mongols massacred thousands of Jin troops. At the time of the political rise of Genghis Khan in 1206 CE, the Mongol Empire shared its western borders with the Western Xia Dynasty of the Tanguts. To the east and south was the Jin Dynasty of northern China. These two regions offered valuable resources and would serve as vassal -states over time as Genghis gained power over these two large territories. His relentless battle tactics also revealed his ruthless viewpoints when it came to disobedient enemy forces and gaining complete control of a region. Map illustrating the neighboring Xia and Jin regions: These two regions were directly adjacent to Genghis Khan’s newly unified Mongol territories in the late 12th and early 13th centuries. The Western Xia Dynasty (also known as the Xi-Xia Dynasty) was located in what is modern-day northern China and sat along the southern border of the Mongol territories. It emerged in 1038 but often struggled to retain independent status from neighboring dynasties. 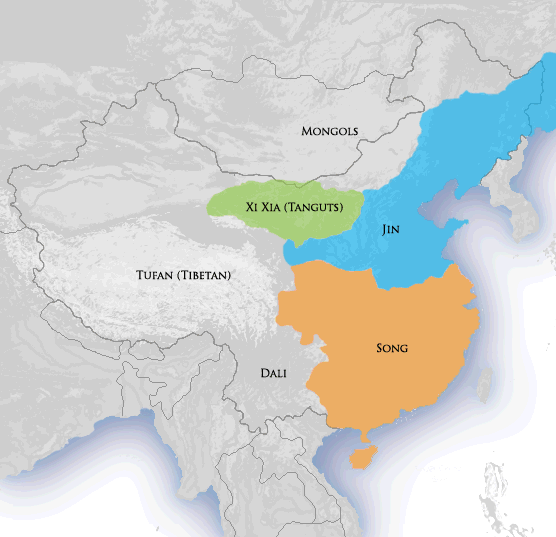 The Xia Dynasty also shared a complex history with the neighboring Jin Dynasty, even serving as a vassal state to the Jin for a period before the arrival of Mongol forces. Genghis Khan first planned for war with the Western Xia, correctly believing that the young, more powerful ruler of the Jin Dynasty would not come to the Western Xia Dynasty’s aid. His very first attempt to gain power started in 1205, the year before he was named supreme ruler on Mongol lands, and his initial attacks were based on a flimsy political pretext. However, he realized that this region would be an ideal gateway to conquering the Jin Dynasty to the south and east. Despite initial difficulties in capturing the Western Xia’s well-defended cities, Genghis Khan forced their surrender with multiple siege battles in 1209 and 1210. Genghis’s relentless battle tactics showed to great effect in the Xia territory. While he initially gained territory in 1209, the second invasion in Western Xia in the 1220s was an example of the bloodshed and slaughter he practiced on cities and populations that did not obey his orders. The population was relatively demolished before his death in 1227 and subsequently under the rule of his son and heir, Ögedei. Some scholars even say this is the first example of ethnocide in history. The tactics and military might Genghis used in the Western Xia region continued as he went on to conquer the larger and more powerful Jin Dynasty in 1211 CE, beginning a 23-year war known as the Mongol-Jin War. Long before the Mongol invasions, Jin leaders took vassal tribute from the Mongolian tribes along their shared border. These leaders even encouraged disputes between these nomadic tribes in order to bolster their own power along their northern border. However, the tides for this powerful dynasty decidedly shifted when the war started during the first Mongol invasion. Jin’s army commander made a tactical mistake in not attacking the Mongols at the first opportunity. Instead, he sent a messenger to Mongols. But the messenger defected and told the Mongols that the Jin Dynasty army was waiting for them on the other side of the Badger Pass. This was where the Mongols massacred thousands of Jin troops and began a long and arduous war that would take a heavy toll on the region. In 1215 CE Genghis captured and sacked the Jin capital of Zhongdu (modern-day Beijing). This forced the Emperor Xuanzong to move his capital south, abandoning the northern half of his kingdom to the Mongols. Between 1232 CE and 1233 CE, Kaifeng fell to the Mongols under the reign of Genghis’ third son, Ögedei Khan. The last major battle between the Jin and the Mongols was the siege of Caizhou in 1234 CE, which marked the collapse of the Jin Dynasty. The years of war took a heavy toll on the population of the Jin Dynasty, as it had in the Western Xia. Mongol warriors were reported to take the livestock from the small towns and villages along their path and kill the owners. Despite the hardship of war and the siege and heavy cavalry tactics utilized by Mongol forces, the unifying and centralizing effects of the Mongol Empire created an expansive trade route and opened up these far eastern regions to western influence and goods. More stability along the trade route known as the Silk Road allowed goods and ideas to travel long distances and established a connection between eastern European principalities like the Russian territories. Jar from the Jin Dynasty: Hunping jar of the Jin Dynasty, with Buddhist figures. Under Genghis Khan, the Mongols, who began using catapaults and gunpowder in their invasions, conquered the Kara-Khitan Khanate and the Khwarazmian Empire. Under Genghis Khan, the Mongol Empire conquered the Kara-Khitan Khanate in Central Asia in 1218 CE. This was a relatively easy conquest because the prince of Kara-Khitan, Küchlüg, had become unpopular with his people due to his persecution of Islam. The empire now had a border with the Khwarazmian Empire, which they proceeded to conquer as well in 1221 CE. The Mongol Empire’s conquest of the Khwarazmian Empire saw huge numbers of civilians massacred and enslaved. During this time, the empire used catapults to hurl gunpowder bombs. The Mongol Empire is often given credit for introducing gunpowder to Europe. By the time of Genghis Khan’s death in 1227 CE, the Mongol Empire was twice the size of the Roman Empire and the Muslim Caliphate. catapult: A device or weapon for throwing or launching large objects. Used by Genghis Khan during the Mongol invasion of the Khwarazmian Empire. Samarkand: The capital of the Khwarazm region, which was captured by Mongol forces around 1221.
gunpowder: An explosive substance; can be used to form bombs. Was introduced to Europe by the Mongols. Genghis Khan created an efficient military regime after his unifying rise to power in the nomadic Mongol territories of northeastern Asia in 1206 CE. These forces were no longer grouped by tribe or familial affiliation, but rather were organized into armies of multiples of ten soldiers that could be sent where needed in the name of Mongol expansion. Genghis Khan sent forces in every direction, including westward into central Asia. While he was fighting the Western Xia and Jin Dynasties in the east, he was also attempting to gain more land to the west in the Kara-Khitan Khanate and the Khwarazmian Empire, regions that comprise modern-day Iran, Iraq, and Uzbekistan. The Mongol Empire conquered the Kara-Khitan Khanate, an empire comprised of former nomads in Central Asia, in the years 1216-1218 CE. The khanate was under the rule of Prince Küchlüg, who had converted to Buddhism and had been persecuting the Muslim majority among the Khitan. This alienated him from most of his people, creating ideal circumstances for a takeover by Genghis Khan. The Kara-Khitai attracted Genghis Khan’s attention when they besieged Almaliq, a city belonging to vassals of the Mongol Empire. Genghis Khan dispatched an army, who, under the command of General Jebe, defeated the Kara-Khitai at their capital, Balasagun, and Küchlüg fled. Jebe gained support from the Kara-Khitan populace by announcing that Küchlüg’s oppressive policy of religious persecution had ended. When his army followed Küchlüg to Kashgar in 1217, the populace revolted and turned on Küchlüg, forcing him to flee again for his life. Jebe pursued Küchlüg into modern Afghanistan. According to Persian historian Ata-Malik Juvayni, a group of hunters caught Küchlüg in 1218 and handed him over to the Mongols, who promptly beheaded him. With Küchlüg’s death, the Mongol Empire secured control over the Kara-Khitai and surrounding areas. The Mongols now had a firm outpost in Central Asia directly bordering the Khwarazmian Empire, in Greater Iran. Relations with the Khwarazms would quickly break down, leading to the Mongol invasion of that territory in 1219. Kara-Khitans Hunting: Kara-Khitans using eagles to hunt, painted during the Chinese Song Dynasty. In the early 13th century, the Khwarazmian Empire was governed by Shah Ala ad-Din Muhammad. Genghis Khan saw the potential advantage in Khwarazmia as a commercial trading partner using the Silk Road, and he sent a caravan to establish official trade ties with the empire. However, a Khwarazmian governor attacked the caravan, claiming that it contained spies. Genghis Khan sent a second group of ambassadors to meet the Shah himself instead of the governor. The Shah had all the men shaved and the Muslim ambassador beheaded and sent his head back with the two remaining ambassadors. Outraged, Genghis Khan organized one of his largest and most brutal invasion campaigns, fought by 200,000 soldiers in three divisions. He left a commander and troops in China, designated his successors to be his family members, and set out for Khwarazmia. Before he left, he divided his empire among his sons and immediate family and declared that his heir should be his charismatic third son, Ögedei. His invasion of Khwarazmia would last from 1219-1221 CE. His son Jochi led the first division into the northeast, and the second division under Jebe marched secretly to the southeast to form, with the first division, a pincer attack on Samarkand. The third division under Genghis Khan and Tolui moved in from the northwest. The Shah’s army, in contrast, was fragmented, a decisive factor in their defeat—the Mongols were not facing a unified defense. The Mongol tactics were precise and often brutally efficient, including heavy cavalry, siege tactics, and even gunpowder weapons. The attack on the Khwarazm capital, Samarkand, was decisive and left the local population depleted and in tatters. Generally speaking, Mongol forces would enslave or massacre populations after a victorious capture of a city or region, establishing a new rule of law and highlighting Mongol dominance. Legend tells that the often flamboyant Genghis Khan executed the Khwarazm governor by pouring molten silver into his ears and eyes. Eventually the Shah fled rather than surrender, and he died shortly after, possibly killed by the Mongols. After their victory, Genghis Khan ordered two of his generals and their forces to completely destroy the remnants of the empire, including not only royal buildings but entire towns, populations, and even vast swaths of farmland. The assault on the wealthy trading city of Urgench proved to be the most difficult battle of the Mongol invasion. Mongolian casualties were higher than normal because most battles they fought were in less densely packed urban settings. However, they were successful, and after an extensive invasion such as this one, young women and children were often given to the Mongol soldiers as slaves. Persian scholar Juvayni states that 50,000 Mongol soldiers were given the task of executing 24 Urgench citizens each. If Juvanyi’s estimation is true, 1.2 million people were killed, making it one of the bloodiest invasions in history. During the invasion of Transoxania in 1219, along with the main Mongol force, Genghis Khan used a Chinese specialist catapult unit in battle, adding to the powerful tactics already in use by Mongol forces. They were used again in 1220 in Transoxania. The Chinese may have used these same catapults to hurl gunpowder bombs. In fact, historians have suggested that the Mongol invasion brought Chinese gunpowder weapons to Central Asia. One of these was the huochong, a Chinese mortar. Chinese Formula for Gunpowder: The earliest known written formula for gunpowder, from the Chinese Wujing Zongyao, a military compendium, of 1044 CE. By the time of Genghis Khan’s death in 1227, the Mongol Empire ruled from the Pacific Ocean to the Caspian Sea, an empire twice the size of the Roman Empire and Muslim Caliphate. The Mongols conquered the areas today known as Iran, Iraq, Syria, Caucasus and parts of Turkey. Further Mongol raids reached southwards as far as Gaza into the Palestine region in 1260 and 1300. The major battles were the Siege of Baghdad in 1258, when the Mongols sacked the city that for 500 years had been the center of Islamic power, and the Battle of Ain Jalut in 1260, when the Muslim Egyptians were for the first time able to stop the Mongol advance. The Mongols were never able to expand farther west than the Middle East due to a combination of political and environmental factors, such as lack of sufficient grazing room for their horses.